I've been waiting and pondering how to use my skein of Aussie Silk Merino that my sister bought me as babysitting payment from the Bendigo Sheep and Wool Show last July. It needed a special project and my original idea I don't think will work. And today I dropped by Ysolda's lovely blog and found my silk merino's project! I've actually been eyeing these off for a while. These Snapdragon Flip-Tops are beautiful. Ysolda creates such wonderful designs. I purchased them today after reading her post about donating 50-80% of sales to help Haiti out of the devastation it's under. I decided it was worthwhile spending the money and I would use my waiting merino. They're going to be quite a feat. I'm sure to need help along the way. They will be the most complicated knitting I've attempted to date. But if I can complete them (and have them looking somewhat like they should) they will be delightful to wear. You can check out Ysolda's great designs and find links to others who are participating in this Haitian help by clicking here. They look cool, and I reckon you'll be able to follow her instructions ok; she's good at writing them clearly. What color is your yarn again? Yeah, I have to make sure I've got all the right tools and then I need to sit down and try and make sense of the instructions. Only had a bit of skim so far. My yarn is shades of dark yellow through orange. 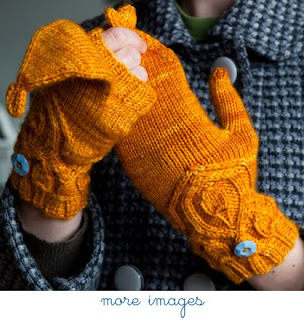 Similar colours to my crocheted mittens but these ones will be much nicer.